Intel's prototype Claremont low-power chip running a PC on solar power. Intel on Thursday showed an experimental low-power processor the size of a postage stamp that could run PCs on solar power. The concept processor, code-named Claremont, can run light workloads on solar power by dropping energy consumption to under 10 milliwatts, said Justin Rattner, chief technology officer at Intel, during a keynote address at the Intel Developer Forum in San Francisco. That is low enough to keep a chip running on a solar cell the size of a stamp. This CPU, also called near-threshold voltage processor, may not become a commercial product, but the research could be integrated into future processors and other circuitry, Rattner said. It is part of a project in Intel Labs to reduce energy consumption five-fold on chips and to bring always-on capability to computing devices. It also will help Intel reach goals to drop power consumption when running parallel processing applications. The chip is an experimental Pentium CPU and ran on a PC with the Linux operating system. The CPU worked in conjunction with concept DDR3 memory developed by Micron called Hybrid Memory Cube, which is seven times more power-efficient than current DDR3 memory. The postage-stamp chip was also demonstrated on Tuesday at Intel CEO Paul Otellini's keynote at IDF. 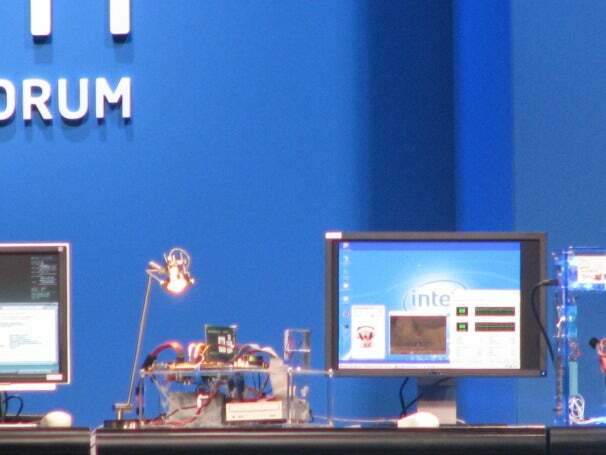 Otellini said Intel wanted to drive down power consumption of chips, and an Intel engineer demonstrated a computer running a small animation powered by a solar panel. After the solar source -- a lamp -- was blocked from the chip, the computer froze. Today's CPUs operate several times higher than the threshold, said Shekhar Borkar, an Intel researcher, during the on-stage demonstration. At low thresholds, the CPU dropped not only power consumption, but also performance. On full power, the CPU operated 10 times faster. The company's goal is to deliver a 300-fold improvement in energy efficiency in high-performance computing over 10 years. To illustrate the point, Borkar said that today's servers need about 200 watts of power for 100 gigaflops of performance. The company wants to drive the power consumption down to 2 watts. Beyond fine-grained power management and efficient memory, extreme-scale computing will require better software and programming models to achieve the goal, and Intel will continue research in those areas, Borkar said.